The WGMS collects data based on the Global Hierarchical Observing Strategy (GHOST) which consists of 5 tiers (GCOS/GTOS, 1997b, IUGG (CSS)/UNEP/UNESCO, 2005). Ultimately the paper uses an older parameterization scheme to look at glacier changes but at the end says it’s not applicable to smaller glaciers and with predicted IPCC warming trends resulting in possibly drastic geometry changes in glaciers the technique used in the paper would no longer be applicable and thus suggests using modern remote sensing technologies. This paper serves as a reference for the usefulness and limitations of using existing glacier inventories to do this. – a good reference for when I’m writing. Updates on glacier inventories should usually be every few decades but with the rate glaciers are receding updates may need to be on shorter intervals. -Using Max altitude, min altitude, length, and total surface area they used the parameterization scheme used by Haeberli and Hoelzle (1995) to look at glacier change. -It looks like I may be able to used some of the equations in the paper but I would need to know the “basal shear stress” and the glacier thickness. Perhaps these are in other studies taken from ground measurements in situ? This would be best applicable on the largest glaciers on Hood & Rainier. 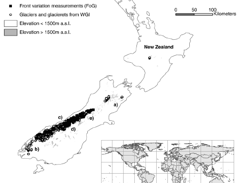 -The paper found the reaction time of the Franz Joseph glacier to be around 7 years as estimated in the study while the response time (time taken to reach equilibrium after a “step” climate change) is around 20 years. -They explain what “response time” means but not “reaction time”. What is the difference? -They found the response time of the large glaciers in the Alps to be much longer than those in the NZ Alps. -After completing the calculations based off Haeberli, Hoelzle found 61% of the original volume has been lost in NZ and around 48% in the Euro Alps. -Many glaciers in NZ are debris covered (thermal insulation). -The calculations in this study are based on 4 simple geometric parameters contained in detailed glacier inventories.. so this could be done by me for Hood and Rainier possibly if I can find the data and use the Landsat for the geometry perhaps…. But paper also notes uncertainties are considerable. – Paper notes that this is better suited for large glaciers than smaller ones so it might not be appropriate for Hood & Rainier after all. -In contrast to the Alps, in NZ the glaciers have experienced a positive mass balance and some have advanced strongly in the 90’s, especially the “wet” glaciers of NZ. Today the glaciers are again retreating. Bishop, M.P., et al., 2004. Global Land Ice Measurements from Space (GLIMS): remote sensing and GIS investigations of the Earth's cryosphere. Geocarto International 19 (2), 57–85. Chinn, T.J., Heydenrych, C., Salinger,M.J., 2005a. Use of the ELA as a practical method of monitoring glacier response to climate in New Zealand's Southern Alps. Journal of Glaciology 51 (172), 85–95. GCOS/GTOS, 1997a. GCOS/GTOS Plan for terrestrial climate related observations. WMO, vol. 796. World Meteorological Organization, Geneva. GCOS/GTOS, 1997b. GHOST Global Hierarchical Observing Strategy. WMO, vol. 862. World Meteorological Organization, Geneva. GCOS/GTOS, 2004. Implementation plan for the Global Observing System for Climate in support of the UNFCCC. WMO, vol. 1219. World Meteorological Organization, Geneva. Haeberli, W., Burn, C.R., 2002. Natural hazards in forests: glacier and permafrost effects as related to climate change. In: Sidle, R.C. (Ed. ), Environmental Change and Geomorphic Hazards in Forests. IUFRO Research Series. CABI Publishing, Wallingford/New York, pp. 167–202. Haeberli, W., Hoelzle, M., 1995. Application of inventory data for estimating characteristics of and regional climate-change effects on mountain glaciers: a pilot study with the European Alps. Annals of Glaciology 21, 206–212. Haeberli, W., Holzhauser, H., 2003. Alpine glacier mass changes during the past two millenia. PAGES News 11 (1), 13–15. Haeberli,W., Cihlar, J., Barry, R., 2000. Glacier Monitoring within the Global Climate Observing System— a contribution to the Fritz Müller Memorial. Annals of Glaciology 31, 241–246. Haeberli, W., Maisch, M., Paul, F., 2002. Mountain glaciers in global climate-related observation networks. World Meteorological Organization Bulletin 51 (1), 1–8. Hoelzle, M., Haeberli, W., Dischl, M., Peschke, W., 2003. Secular glacier mass balances derived from cumulative glacier length changes. Global and Planetary Change 36 (4), 295–306. Kuhn, M., 1989. The response of the equilibrium line altitude to climatic fluctuations: theory and observations. In: Oerlemans, J. (Ed. ), Glacier fluctuations and climatic change. Kluwer, Dodrecht, pp. 407–417. Kääb, A., et al., 2005a. Remote sensing of glacier-and permafrost related hazards in high mountains: an overview. Natural Hazards and Earth System Sciences 5, 527–554. Kääb, A., Reynolds, J.M., Haeberli,W., 2005b. Glacier and permafrost hazards in high mountains. In: Huber, M., Bugmann, H.K.M., Reasoner, M.A. (Eds. ), Global Change and Mountain Regions (A state of Knowledge Overview). Advances in Global Change Research. Springer, Dordrecht, pp. 225–234. Leysinger Vieli, G.J.-M.C., Gudmundsson, G.H., 2004. On estimating length fluctuations of glaciers caused by changes in climatic forcing. Journal of Geophysical Research 109, F01007. Nye, J.F., 1960. The response of glaciers and ice-sheets to seasonal and climatic changes. Proceedings of the Royal Society of London. Series A 256, 559–584. Paul, F., Kääb, A., Maisch, M., Kellenberger, T., Haeberli, W., 2004. Rapid disintegration of Alpine glaciers observed with satellite data. Geophysical Research Letters 31 (21), L21402.